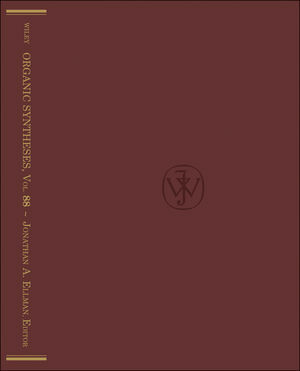 The current volume continues the tradition of the Organic Synthesis series, providing carefully checked and edited experimental procedures that describe important synthetic methods, transformations, reagents, and synthetic building blocks or intermediates with demonstrated utility in organic synthesis. These significant and interesting procedures should prove worthwhile to many synthetic chemists working in increasingly diverse areas. A trusted guide for professionals in organic and medicinal chemistry in academia, government, and industries, including phar-maceuticals, fine chemicals, agrochemicals, and biotech. Jonathan A. Ellman is Eugene Higgins Professor of Chemistry at Yale University. He received his B.S. in Chemistry from MIT and his PhD in Organic Chemistry from Harvard University. His research efforts are focused on the development of efficient, systematic chemical tools to establish protein function through the design and synthesis of small molecule libraries targeting protein families, methods for the asymmetric synthesis of amines, and the development of synthetic applications of C-H activation.